The Italian language can make just about anything sound romantic and frilly, and this dish is a pretty great example of that. Though pasta aglio e olio sounds elegant, it translates to “pasta with garlic and oil”. Woah-hoh! But, there is a bit more to it than that. This dish is created by lightly simmering sliced garlic in olive oil and, if you know what’s good for you, dried red chili flakes. This oily goodness is tossed with your fave long pasta — typically spaghetti — as well as freshly chopped parsley, and some parmesan or pecorino-romano. Some recipes will tell you to nix the cheese, but not *this* recipe. Though my husband has always spoken highly of this dish, I wasn’t too interested until I saw David Rocco’s recipe on David Rocco’s Dolce Vita. At first blush, I thought adding carbs to carbs was hella sinful and something I should avoid, but heck no. How many of us eat bread with our pasta? Despite the breadcrumbs, this dish might seem pretty pedestrian — but it manages to shine in all of its simplicity. It’s light and delicate in flavor, but it’s totally what you make of it. If you’re a garlic fiend like myself, you can add tons of garlic; if you like your pasta spicy, turn up the heat and go batshit crazy with the chili flakes. This dish takes less than 20 minutes to prepare and calls for six measly ingredients that you likely have in your pantry right now. What is there to not love? Add this to your weeknight meal plan stat, friends. This 15-minute wonder is what it's all about. 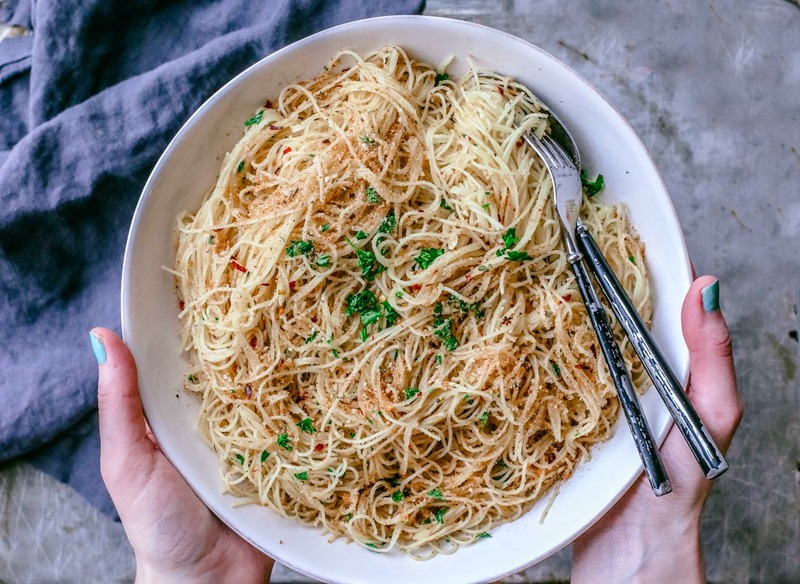 Simple yet flavorful, pasta aglio olio pleases garlic lovers and chili lovers alike; the toasted breadcrumbs are a welcomed bonus. Toss the breadcrumbs and parsley in a small, dry saucepan. Toast over medium-low heat until the breadcrumbs are golden brown. Stir frequently to prevent burning. Always keep a close eye on the breadcrumbs, because once they start to brown, they brown very quickly! Once the breadcrumbs are golden and fragrant, set aside. Bring salted water to a boil and add the pasta. Boil for approx. 2 minutes or until almost al dente (refer to packaging for timing — different noodles vary in cooking time, but angel hair doesn't take long to cook). Ladle a spoonful or two of pasta water into a separate bowl and set aside; drain pasta. While the pasta is cooking, heat the olive oil on medium heat. Add the garlic and the chill flakes. Simmer until the garlic is fragrant and slightly golden. Don't brown the garlic, or you'll get a bitter flavor. Once the pasta is ready, add the pasta to the oil, garlic, and chill flakes. Add the reserved pasta water, and toss to coat, cooking for another minute or so. Before serving, add the breadcrumbs and parsley, and toss to coat. Garnish with extra fresh parsley (optional). I made this last night and loved it! It was so easy and tasty. The addition of bread crumbs is pure genius. Sometimes the simpler recipes are the best ones! I love this texture combination you've got going on- breadcrumbs, cheese, pasta, parsley, chili flakes... YUM! Right up my alley. My go-to pasta dish: hot pasta, egg whisked with a bit of the pasta water, chopped walnuts, chopped cilantro (oh wait- you hate cilantro don't you? Replace with parsley! ), a generous dose of good quality olive oil and some S&P. SO good! Oh girl. Your go-to pasta dish sounds incredible! I love the addition of walnuts! I have to give that a whirl sometime. Also, I'm impressed by your memory regarding my hatred toward cilantro ;) I guess I do tend to be pretty vocal about it, haha. You are 100 per cent right, Dana: pecorino romano makes EVERYTHING better. And toasted breadcrumbs?! Bring on the gluten. This is such a perfect dish for when you have nothing in pantry and need to get food on the table ASAP. No one will say no to pasta with oil, garlic, cheese and breadcrumbs! The bread crumbs are LIFE. I can't imagine this dish without them anymore. I mean hey, it works and it's still delicious, but once you get a taste with those crispy toasted bits… damn. Cheese please! Oh. And garlic. And all the chili flakes. I'll just sub in some g/f pasta and we'll be good to go! Yum. Thanks, Nathalie! It's true! It's amazing how simple you can keep things with pasta and somehow have it turn out to be pretty elegant. While I've been known to craft the occasional complex pasta dish, I have to say that I hold a deep love for recipes like this. First of all, I'm a self-confessed carb fiend, so yayyyy to the breadcrumbs on pasta. Also I have to agree with you - everything's better with cheese. But honestly, pasta dishes like this are such a great way to demonstrate the value and flexibility of really good ingredients. There's no trickery or hiding behind big flavours - it's just simple and amazing stuff. And I LOVE it. I'm so glad you posted this - and so glad that you put useful and detailed instructions in. After all, if you're going to rock an elegant, minimalist pasta, then you need to know what you're doing! Cheers! Thanks, Sean! Couldn't agree more. Once I grew more interested in Italian cuisine and started to eat at more authentic Italian restaurants, I quickly learned that 1. fresh pasta is everything, and 2. you really don't need to add much to a pasta dish if you have a solid homemade sauce. I do enjoy the odd crisp-cleaning pasta bake to get rid of veggies before the turn, but if I'm planning a solid Italian meal, simple is the way. Oh yes! I'm a sucker for angel hair pasta! Knowing me, I'd most likely end-up adding roasted veggies to it, but what a lovely classic dish! Yum! Gimme garlic over everything! It's hard to go wrong with some roasted veggies. I think roasted broccoli would turn this into an even bigger winner. Noms. It will be a cold day in hell if I ever snub cheese :) Thanks, Marie! Mmmm...garlic simmered in olive oil. How amazing! I love dishes that are quick and easy to prepare with few ingredients, and this one looks like a wonderful treat! Thanks, Cathy! It's definitely one of those weeknight wonders.